Whenever a big company announces an impromptu special event, chins begin wagging as to what products or services said company will be bringing to the table. With the incessant talk of a follow up to the ASUS-manufactured Nexus 7 arriving soon, it’s more than likely the Android community will begin talking and speculating about its possible announcement this time next week. The Nexus 7 2 may not be worthy of an event of its own, particularly given that the design is expected to remain relatively similar. In fact, aside from a rear-facing camera and a faster, possibly Snapdragon 600 quad-core jobby, there’s not really a great deal to write home about considering it’s been a year since the original was released. But the real show stopping rumor pertaining the Nexus 7 2 is that it could be the first to ship with Android 4.3 Jelly Bean right out of the box, which changes the dynamic of the announcement completely. If, as we anticipate, Google does plan to drop the Nexus 7 sequel next week on June 24th, could it be that we’ll also be getting our first legitimate glimpse of the next version of Android. While Android 4.3 is certainly not 5.0 Key Lime Pie – the version many Droidsters are really waiting for – we’d still expect some pretty tasty updates worth taking a look at. It’s long since been known that Android 4.3 will likely adopt Bluetooth Low Energy, or BLE (recently rebranded as Bluetooth SMART), but aside from that, the search giant has done pretty well to keep remaining details under wraps. With Sundar Pichai, lead of Chrome and Android, hosting proceedings, it will be intriguing to see what the main topics of conversation are. The Chrome browser has recently seen an update for Windows and Mac, so there’ll be talk of some future changes and implementations to be made. But I think I speak for most when I say that the vast majority will be waiting for something newer, sweeter, and potentially running on a newly-updated device. This is mere speculation, however. All will become clear next Wednesday, and we’ll have coverage of the day’s events as they unfold right here at Redmond Pie, so stay tuned! 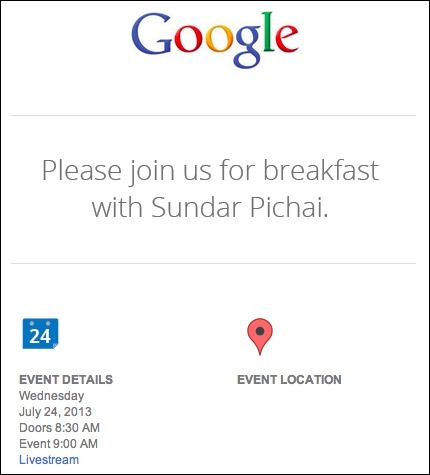 What do you think Google will announce at this event? A new Nexus handset maybe? Who knows!